Holiday Bible Club | Let their light shine! We used a wooden spoon based craft for the bible story about Jesus healing a man who had leprosy. You can read the story in Matthew 8. The children drew a sad face one side of the spoon and a happy face the other. We used kitchen roll for the clothes – a fairly good quality brand that the children could decorate with felt pens. The arms and belt are pipe cleaners. Use a slighty longer pipe cleaner for the arms. Colour/decorate the square of kitchen roll – I cut the kitchen roll squares into quarters which made them just the right size for our small wooden spoons. Once coloured fold the quarter in half and then in half again and make a small cut on the fold. Slide the spoon through this and then add the arms. Finally add the belt. This basic idea can be used for retelling lots of Bible stories. Large wooden spoons make great puppets too. Have a look at this idea here. 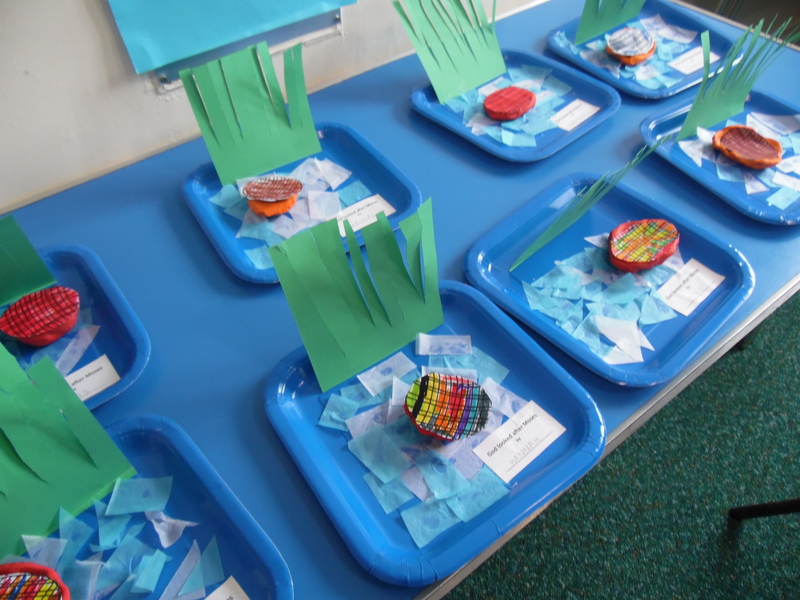 We are getting ready for a HBC – these three crafts fit our sport theme. The paper bags, trophy and flag are all from ‘the little crafty bugs company’. The template for the paper bag runner puppet (it cost $4 ) is from ‘teachers pay teachers’. I’ve made a baby Moses paper plate craft before but wanted something a little simpler for our Holiday Bible Club as we don’t have a lot of time per age group. So this time there was no drawing round hands and the paper plate is a square plate. To prepare I pre cut a slit in each square plate, prepared a piece of green card the right size to slot into the slit and printed lots of baby Moses’s and basket lids. 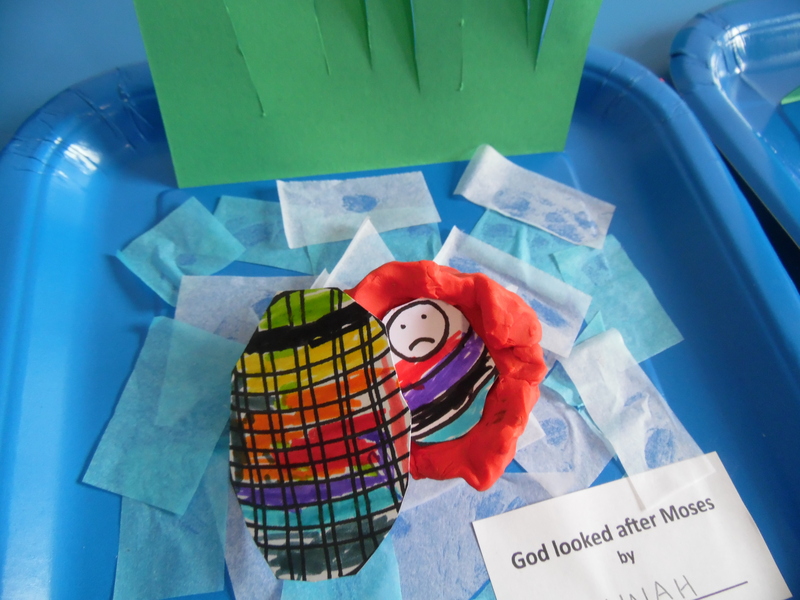 The children needed to cut the green card to make reeds, slot into the plate (a leader then used cellotape to secure the green card under the plate), mould a plasticine basket and place a coloured in Moses inside. The plate was decorated with blue and white tissue paper. A label was added ‘God kept Moses safe’ by ________. You could use air drying clay but the plasticine was pretty much mess free. There is a softer version for young children. Moses has a sad face because he was crying when the basket was opened. Plasticine also from Amazon and also Hobbycraft and WHSmith.